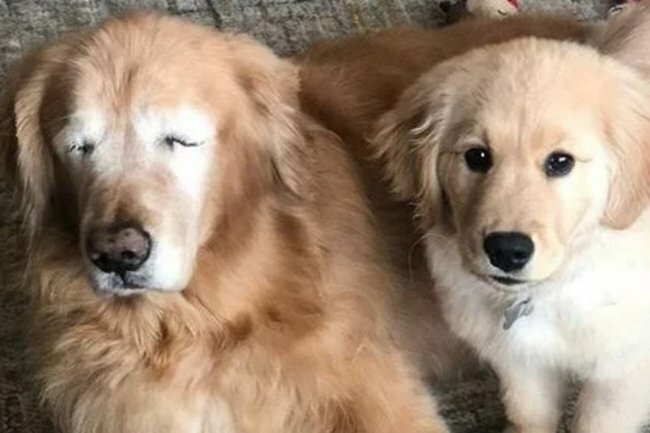 Let us cry over blind dog Charlie and his seeing eye puppy Maverick. We are about to show you images of a blind dog called Charlie and his four-month-old guide puppy Maverick. Yes, it is just as delightful as it sounds. Charlie is an 11-year-old golden retriever who, in 2016, had to get his left eye removed after suffering from glaucoma. A year later his right eye had to be removed as well, leaving him blind. In January, little Maverick joined Charlie’s family and although they initially didn’t get along, over the past couple of months they’ve become best friends. Charlie now relies on Maverick for guidance when walking, playing and eating. They are now a very iconic duo. Owners Adam and Chelsea Stripe, from North Carolina, made an Instagram account for the pair and have been totally blown away by the response. It has accumulated more than 80,000 followers in less than a week. “They’re both pretty crazy and special. They’re definitely our entertainment,” Chelsea told NBC Philadelphia. “When they would play, Maverick would realise that Charlie would lose the toy sometimes, so he would pick it up and put it back in front of him to re-engage playtime,” she said. Please, join us in sobbing over the goodness of dogs as you scroll through the below images. It looks like Charlie closed his eyes to make a wish and Maverick appeared to make that wish come true!